Because of Mike’s outsized fandom, we asked him to kick off the #SDCC week with some of his thoughts on the spectacle and how geeks came to dominate the mediasphere. This week is San Diego Comic-Con, possibly the single biggest SF/F convention in the world (certainly the biggest one in North America). I’ve never been to SDCC, but as more than a hundred thousand of my fellow fans assemble across the country, my thoughts are with them. Reflecting on how gigantic SDCC has become, it’s funny to think that when I was growing up, comics and fantasy novels were patently uncool. Professing a love of Science Fiction & Fantasy meant that you were a geek, a nerd, a dork, and a (choose your derogatory term). Boy how times have changed. SF/F rule the box offices, with adaptations, reboots, and more. But most importantly, Geek has become a certain version of cool. To me, it’s pretty easy to argue that we’re in A Golden Age of Geekdom. Between shows like LOST, Smallville, the new Battlestar Galactica, and Game of Thrones, book series like Harry Potter, Twilight, and The Hunger Games, and films like The Lord of the Rings, The Dark Knight, and Marvel’s Avengers, SF/F properties have become a cultural and economic powerhouse. In the decade, the biggest films have all been speculative fiction, most of them adaptations from books and comics, categories which were “uncool” when I was growing up. A constellation of trends and phenomena have SF/F front and center in the entertainment landscape, from the increasing sophistication and relative affordability of digital effects (video games have become a 25 billion dollar industry), to the Harry Potter series and the rise of YA literature, increasingly successful superhero films, The Twilight books and films, and more. Hollywood executives have decided the works that many of us grew up with, loving at conventions and over the early versions of the internet (and my older colleagues talked about via mimeographed fanzines and BBS communities), are MADE OF MONEY. And the box office receipts are proving them right. For me, this leads to one big question: so what? What does it really mean for me and for other geeky folk who are now finding the stuff we’ve loved for decades suddenly being adopted and embraced by zillions of others? How do we respond? Instead, my response is, “Now I have more people to talk to about these things I love!” Geekdom is not a zero-sum thing. The fact that many more people love Batman now doesn’t mean I have to stop loving Batman. In fact, there’s likely to be even more Batman stuff to love, precisely because it’s popular. A quick story by way of example: a month ago, I wore a Superman shirt while wandering around Baltimore’s Inner Harbor, and a busker saw me, called out “Superman!” and started playing the John Williams film theme on his trombone. It lifted my spirits and put a gigantic smile on my face. In this Golden Age of Geekdom, we have no need to hide our passions. Instead, I feel invited to share them with others, to offer friends and acquaintances my recommendations when they express interest. Liked the Game of Thrones TV show? Check out these other epic fantasy series. Loved The Dark Knight? Here’s some entry-level comics that show off what the comics medium can do. And I’m very glad to see others doing the same: on the internet, in person at conventions, everywhere. I’d like to end with a call to action: Pacific Rim just hit theaters, and it’s a fairly rare bird: a blockbuster science fiction film that’s entirely original – not an adaptation, not a reboot, nothing. As much as I love many of the book and comic adaptations we’ve been getting, I think it also behooves SF/F lovers to support original genre films, especially ones that involve Giant Mecha Punching Kaiju in the Face! Because I don’t know about you all, but Pacific Rim is exactly the kind of movie that Kid Mike thought would never get made. So let’s celebrate our cultural ascendance and treat ourselves to one of the bounties brought to us by this Golden Age of Geekdom. If you’d like to see more of Mike, check out his books below, his blog GeekTheory.Wordpress.com, or his Twitter feed @MikeRUnderwood. 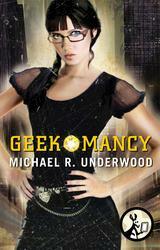 If you want to check out more of Celebromancy, read Chapter One over at io9.com. 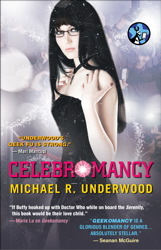 To check out Simon & Schuster’s SDCC booth and giveaway schedule, as well as a great eBook sale (including Celebromancy for only $1.99), go to the SDCC landing page. And check out our sweepstakes here. Happy Geeking, and everyone travel safe this week!